My dashboard tells me I haven't published a post since April. My guilty conscience thought it had been longer than that! Mercy me, I am ashamed. It's time for the weekly party hosted by Julia over at Stamping Ground. 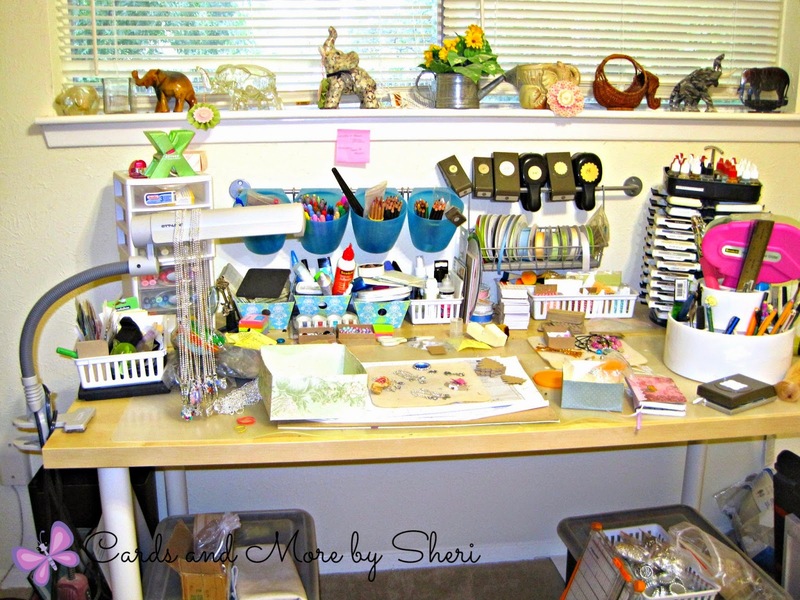 If you've never seen it before, it's a worldwide crafty party and we all get to sneak a peek at everyone's crafty space. Make sure you pop over there and check it out. It's loads of fun. My desk looks pretty bad. The sad part is, this is halfway through a clean up effort. 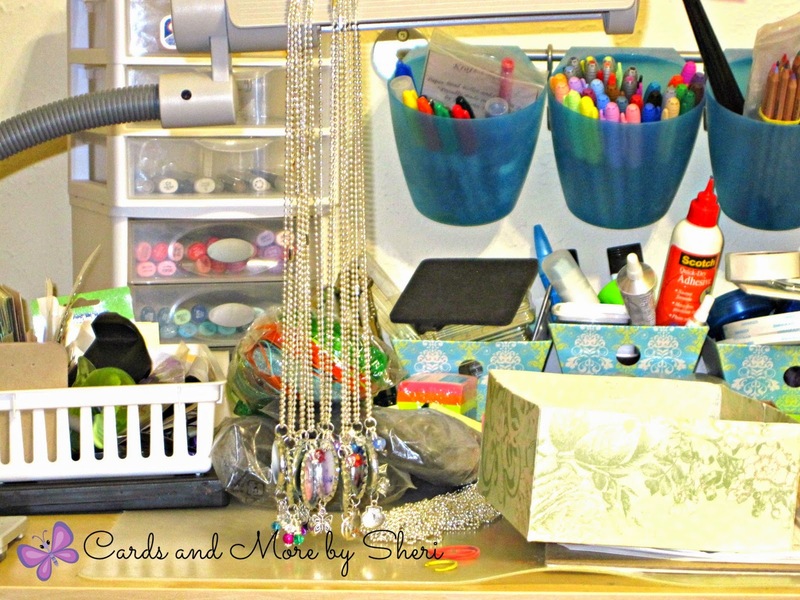 Yesterday it was covered with much more jewelry making paraphernalia. And don't even get me started about how bad the floor looks! Eeeek! I've been on a kick of designing my own bottle cap images and making some necklaces. My poor Ott light is even presently doing double duty as a necklace holder. Just a little sampling of some of the necklaces I've made so far. I'm starting to gear up for Fall craft shows. I have a local place that has craft fair/flea markets two weekends per month. They will be starting up again in September. I won't participate then because it will still be too hot for me in their barn then. I'm aiming for the mid-October show and going through December. I'm hoping with it then being closer to holiday shopping time, I'll have a better result. I'm even thinking about having all of my offerings be $5 each, regardless of whether it's jewelry or some of my paper crafty items. What do you all think of that? Pricing is such a difficult thing. Some folks say if you price too low, people think that is reflective of the quality. On the other hand, if you price too high and no one buys, does it even matter what they think of your quality? It's a constant dilemma. Chime in and let me know what you think! 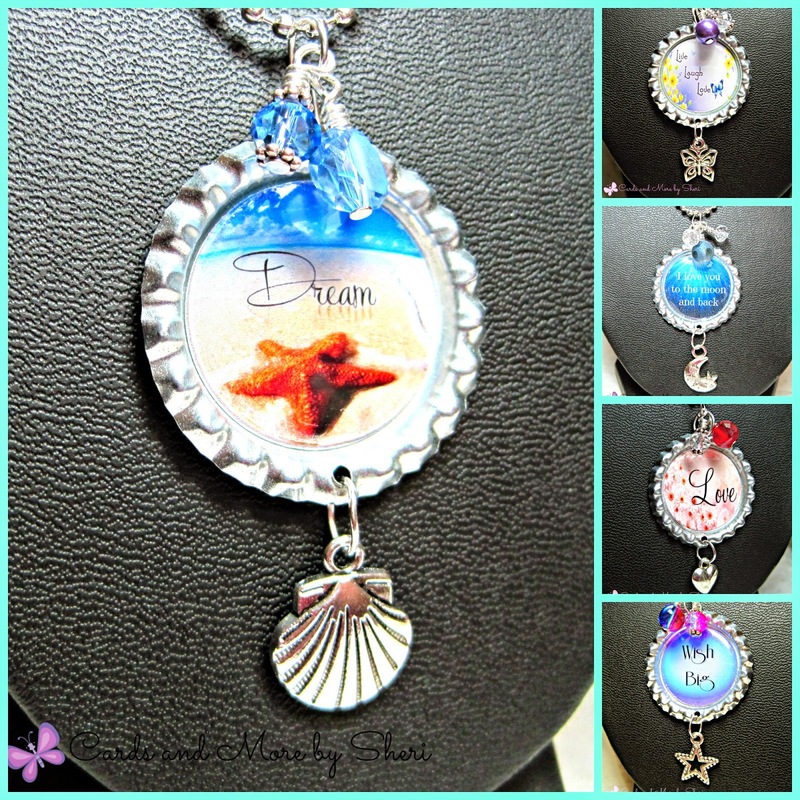 The necklaces are very pretty and ideal for gifts. I do not know much about pricing but it is double to cost of production , meaning supplies and labor. I do not know where you are but you might want to look at others prices for similar items. I have seen some ridiculously high pricing at shows around the country especially by younger producers. I live in Texas and the high prices were in Dallas were they seemed to base their price on manufactured goods and thought since theirs were hand made they should be higher. Hello Sheri. I like those necklaces - they are really attractive. I hope you have success in selling them. yes, pricing your items is really difficult. Here in Britain folk will merrily hand over more than £2 for a commercially made, mass produced card - but try selling your own cards - even for charity - for £1 and folk say "But it's only home made"!!!!!!!!! I confess to being an utter failure where selling my work is concerned... so no help from here, I'm afraid.